In April for the past 12 years, Habitat for Humanity of Tulare/Kings Counties has welcomed spring with a birdhouse auction. “Everybody deserves an affordable home,” is part of their mission, so they extended that out to wildlife and now, well, it’s going to the dogs, too. It was a committee decision, said Deanna Saldana, Habitat’s local chapter resource development director, to expand the auction to include dog houses. “After 12 years, we thought we might look at something else we can auction off,” she said. The Bird House auction traditionally has had live bird house auctioned off, as well as some by silent auction, where other items include gift baskets donated by businesses and individuals from the local community. Many artists have repeatedly donated to the auction, often trying to outdo their own creations from the previous year. This year, some have donated both a bird house and a dog house. 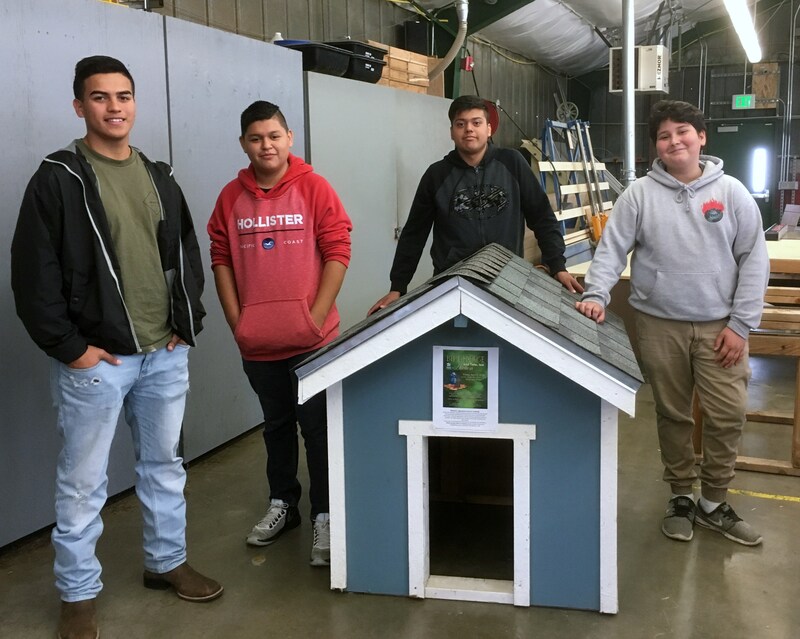 Also this year, some high school students have stepped up to the cause with their own dog house creations. Dinuba High School’s trade construction class is one such group. Instructor William Olinger, had shown an interest in his class getting involved in a house-building project. However, the involvement for those under 18 is limited, Saldana said. She mentioned the auction addition of dog houses, which of course, is a much smaller scale, but, Olinger and some of his students jumped at the chance. He understood the potential liabilities of minors being involved. His classes have been involved in working with other groups in landscaping, and installing sprinklers, etc. In their regular class discipline, his class had built dog houses in the past. The project was a perfect fit for his students. Excited about the project and the auction, some students also built and painted six bird houses as well. The kids are of mixed grade levels, from 9th through 12th. Similarly, the Harmony Magnet Academy in Strathmore got involved too. The flyer asked constructors to use as much recycled material as possible for the project, so the class started with a used shipping crate. In past year, bird houses have brought anywhere from $250 – $900 during the live auction, she said. Last year the auction grossed more than $46,000. The inclusion of dog houses should bring more. “When you send it out to the creative world, you never know what you’re going to get,” she said. The 13th Annual Birdhouse (and ToTo Too) Auction takes place Friday, April 6 at the Wyndham Hotel in Visalia. Doors open at 6pm. Funds from the event support Habitat for Humanity’s programs throughout Tulare & Kings Counties. The fundraiser includes wine-tasting and great food from dozens of local restaurants in an evening full of flavor, entertainment, and incredible artistic creations. Tickets are $100 and may be purchased at www.hfhtkc.org/birdhouse-auction/ or call (559) 734-4040.